No other room better embodies the word ‘haven’ quite like the bedroom. From cosy Sunday mornings spent with tea in hand, to those lazy afternoons with a good book, the bedroom is a place of calm. A place to forget the rest of the world and relax. 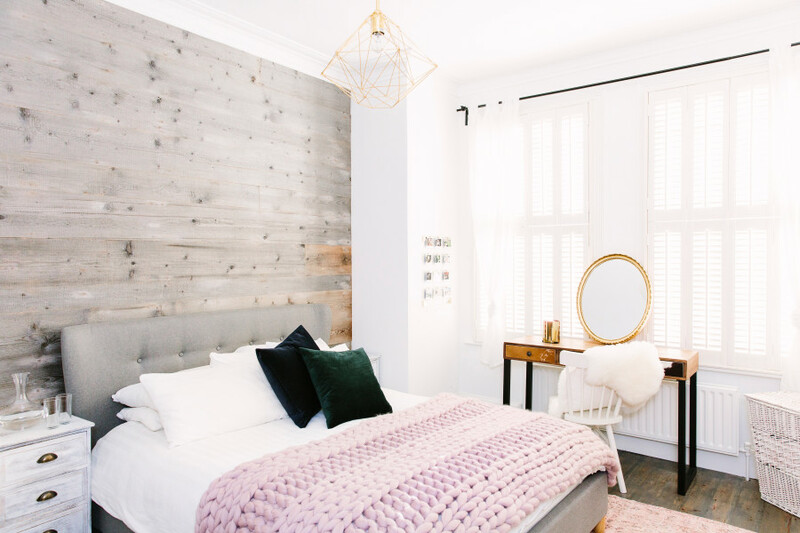 If you’re not one for filling an entire room, a feature wall is a great way to give a sense of design, while allowing you to give minimal touches to the rest of the space. In this Resi designed room, this wooden feature wall gives a focal point to the room. It’s soft grey tones perfectly suite the white, gold, and dusty pink palette. With these soft colours against the other white walls, this modest sized room is made to feel bright and airy, giving a sense of open space. However, if you’d like to opt for something darker, why not look into art murals? If you’ve got a lot of space to play with, and want to separate your practical elements from your snuggly, then a partition might be the answer. Rather than completely break up your room with a seperate walk-in closet, you can create something similar through some clever partitioning walls. As architects, we’re all about clever functional design. Some of our favourite partitions are those that are able to provide great practical results, while still tying in with the aesthetic of the room. Look into open shelves to keep light flowing through the room. If you’re converting a loft into a bedroom space, don’t let those wonderful trusses go to waste! Exposed wooden beams are a wonderful, unique touch to add to any bedroom. The wood helps bring warm tones into the space, adding to that much desired cosy feeling. To get the best results, talk to your architect early on in your loft conversion. Even if you don’t have the right beams to expose, they’ll be able to offer advice on adding in this desirable feature. Light, light, and more light. That’s the secret of a happy home. Increasing the natural light in your home is scientifically proven to boost your mood, as those sunny beams help stimulate the serotonin in your brain - aka the happiness hormone! What’s more, installing floor to ceiling windows is the perfect way of utilising any stunning skylights, or rural beauty spots, that might surround your home. Of course, there are many factors to consider when looking into glazing. For starters, it’s worth investing in thermal controlled glass. This will stop your bedroom from becoming an igloo in winter, and keep your heating bills down. However, good glass costs money, so you’ll have to be prepared for a big investment at the start. To work out how eco-friendly your new windows are, check out their U-values. The lower the U-value, the more heat they’ll keep in. Think bunk beds are just for kids? Think again. More and more people are now seeing the benefits of utilising their high ceilings, with some amazing multi-level bedroom designs. By moving your bed higher, you open up space for any number of desirable features, such as: an office, reading nook, or simply somewhere to kick back with some Netflix. Now granted, you’ll need some tall ceilings to make this work. You don’t want to be waking up to a bump on the head everyday. But for those living in tall Victorian townhouses, this is a great option for turning one room, into two. For a sturdy structure, talk to an architect about your options. Wooden bed frames were fine when you were five years old, but grown-ups need a little more… support from their high rise beds.